The Chicago Fire was 4-1, but coming off a big loss to the Florida Blazers, as they faced the Philadelphia Bell in World Football League action on August 14, 1974. The Fire, coached by Jim Spavital, had Virgil Carter at quarterback (pictured at right), a smart and experienced player who had been with the Bears and Bengals in the NFL. The running game was strong with HB Cyril Pinder, formerly of the Eagles and Bears, and unheralded but effective rookie FB Mark Kellar. Philadelphia was coached by Ron Waller and featured an exciting and complex offense that was guided by QB Jim “King” Corcoran, an eccentric field general who had been around the minor league football circuit for nearly a decade. Running backs John Land and Claude Watts were also experienced minor league players who were proving to be productive, although Land was out for the game at Chicago. The Bell’s record stood at 3-2 and they were determined to keep pace with the New York Stars in the Eastern Division. But while the team had drawn huge crowds to JFK Stadium for its initial home games, it had recently been learned that many of the tickets had been distributed for free or at a substantial discount, casting a shadow over both the franchise and WFL. There were 27,607 fans in attendance at Soldier Field for the Wednesday night game. The Fire, coming off the big loss the previous week, seemed flat during the early going. The Bell scored first in the opening period as Claude Watts ran for a six-yard touchdown. RB Alan Thompson added the action point for an 8-0 lead (in the WFL, touchdowns were worth seven points and were followed by an action point, which could not be kicked). Before the period was over, Chuck Ramsey booted a 26-yard field goal for the home team and the score was 8-3 after a quarter of play. In the second quarter, Cyril Pinder caught a pass from Virgil Carter for a six-yard TD and Carter ran for the action point. Mark Kellar added a one-yard touchdown carry and although the try for the action point failed, Chicago held an 18-8 lead. The Bell scored once again in the first half as Corcoran connected with Thompson for a two-yard TD. The pass for an action point was unsuccessful and the score stood at 18-15 in favor of the home team at the intermission. The Fire took command and opened up a 25-15 lead in the third quarter as Pinder scored another touchdown, this time on a one-yard carry through the line. The action point attempt failed. Meanwhile, the Fire’s defensive line harassed Corcoran and the Bell could get nothing going offensively. However, Chicago’s 10-point lead evaporated in the fourth quarter as the Bell scored twice. First, Chicago safety Barry Ruffner fumbled a punt at his own 10 yard line to set up a Philadelphia score. Corcoran ran for a TD from a yard out although the pass attempt for the action point failed. Four minutes later, a shanked punt gave the Bell good field position at the Chicago 45. It didn’t take long for the visitors to capitalize. On the next play, Corcoran tossed a pass down the middle to Watts that resulted in a 45-yard touchdown. Again the action point try was unsuccessful, but Philadelphia led by 29-25 with 8:13 remaining in the contest. Still behind with 3:34 left on the clock, the Fire drove 80 yards in nine plays. Carter completed five straight passes along the way, the last to WR Jack Dolbin from 11 yards out for a TD. The action point attempt was no good but the home team was back in front by three points with the clock down to 1:34. The lead held up and Chicago came away with a 32-29 win. Chicago accumulated 394 yards on offense, to 346 for the Bell, with 275 of that total coming on the ground. The Fire also held a 23 to 15 advantage in first downs. Philadelphia turned the ball over three times, to two suffered by Chicago, and was hurt by 10 penalties. Both Cyril Pinder (pictured at left) and Mark Kellar reached triple digits in rushing yards, with Pinder gaining 151 yards on 18 carries and Kellar running for 112 yards on 23 attempts. Each scored a rushing touchdown and Pinder added another on one of his two pass receptions. Virgil Carter completed 12 of 20 passes for 119 yards and two TDs with one intercepted. Jack Dolbin and Mark Kellar each caught three passes, for 26 and 13 yards, respectively. TE Don Burchfield gained 37 yards on his two receptions to top the club. For the Bell, Jim Corcoran was successful on 17 of 34 throws for 256 yards and two touchdowns but with three interceptions. Alan Thompson paced the ground game with 49 yards on 16 carries and while Claude Watts ran for only 20 yards and a TD on 5 attempts, he also caught 5 passes for 144 yards and the one long score. Thompson also had five receptions, for 29 yards and including a TD. The Fire appeared to be back on track and won two of their next three games, but reversed course and didn’t win again the rest of the season. Injuries, in particular to Virgil Carter, were the primary culprit as Chicago ended up at 7-13 and third in the Central Division. Philadelphia was 9-11 and third in the Eastern Division, although in bizarre fashion they made it to the postseason, falling in the first round. 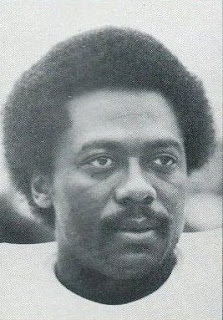 Virgil Carter ended up ranking second in the WFL in touchdown passes with 27 – putting him behind Jim “King” Corcoran, the league leader with 31 – and also in completion percentage at 54.5. Cyril Pinder led the club with 925 rushing yards on 179 carries for a fine 5.2-yard average. He scored a total of 11 touchdowns, putting him second on the club to Mark Kellar with 15. Claude Watts ended up leading the Bell in touchdowns with 18 (and was second in the WFL overall) as he rushed for 927 yards on 199 carries (4.7 avg.) and caught 46 passes for 584 yards.